The Esso tanker was the first one I got as a kid. I got it for my 5th birthday. On my 6th birthday I bought the ACL container truck. The ACL truck came with a clip you'd mount to the containers to allow the crane to remove them. Hours of fun! 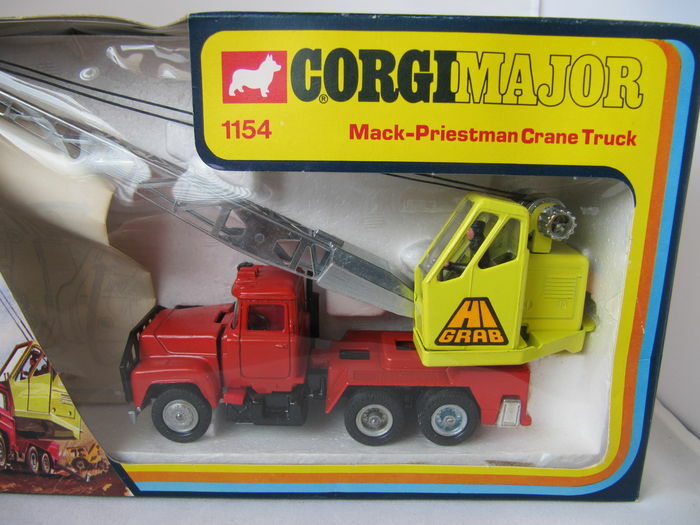 For my 9th I got a Corgi Mack truck with a flat deck carrying a Centurion tank. I still have this one (packed away). The only reason it survived is the rear wheel on the trailer had a bent axle and wouldn't roll worth a damn. It spent most of the time on the shelf. The car hauler was purchased by a CP member. I seem to recall that one was always out of my price range. My latest score is the "Trans Continental" truck pictured above the ACL truck. This truck was always in the Corgi catalog (circa 1974) but never showed up in a local store making me want it even more. Even today it rarely shows up. Well low and behold it showed up in my hometown of London so my buddy Nick picked it up and shipped it to me (seller wouldn't ship). The seller has a couple of other trucks I want but he wouldn't do a package deal and I'm on a budget. My man cave is getting closer to completion and I'm looking forward to putting these and my other die cast models on display. In the background you can see a boxed Dinky Flatbed from around 1972 and a Corgi Ice cream truck that I scored about a month ago. It's a really nicely detailed model. Here is some of mine from my childhood. Your trucks survived better than mine did! I also had the Matchbox car carrier (one was all yellow, the other had a blue cab and gold trailer). I also had the AFX Superbird except mine was yellow and black. You should see what my childhood Batmobiles look like! Yes, I still have them, but they are only almost a 1/4" thick after my Dad ran them over with the '65 Belair ... with a little help from me. Lol. I did that with several toy cars!